By W. Gardner Selby on Tuesday, December 13th, 2016 at 10:13 a.m.
Rick Perry arrives at Trump Tower Nov. 21, 2016 where President-elect Donald Trump was reportedly waiting to talk with him (Photo by Spencer Platt/Getty Images). 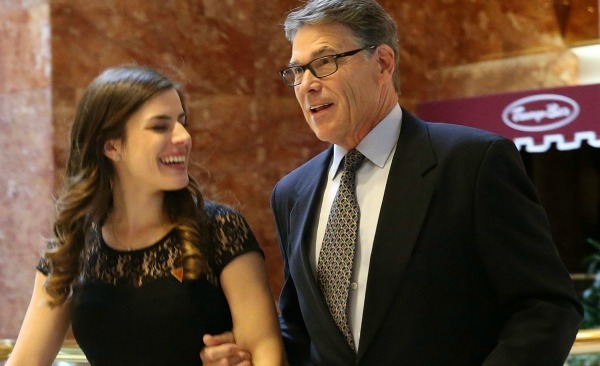 Rick Perry, reportedly chosen to serve as secretary of energy by President-elect Trump, hails from a state rich in energy resources. And we have checked a few energy-connected claims by the former Texas governor and two-time presidential aspirant. Of the latest 100 PolitiFact fact checks of Perry--see all of our Perry checks here--a few centered on energy-related statements. --PolitiFact New Hampshire found Mostly False a June 2015 Perry claim that Canada, Mexico and the U.S. together had "more known reserves" than in Russia and Saudi Arabia. Perry was right about coal, but wrong on natural gas and crude oil. --PolitiFact Virginia in February 2015 rated True Perry's claim that the U.S. produces more oil and gas than any other country. --PolitiFact National in August 2011 rated Pants on Fire a Perry claim that President Barack Obama delivered $2 billion to Brazil to help with offshore drilling projects. The initial commitment, of far less money, was made on President George W. Bush’s watch. --Also in August 2011, PolitiFact rated False a Perry claim that scientists were increasingly "questioning the original idea that man-made global warming is what is causing the climate to change." To the contrary, reporter Angie Drobnic Holan found solid consensus among the major scientific organizations per human contributions to global warming. MOSTLY TRUE: A Democrat’s 2010 claim that Rick Perry tried to fast-track coal-fired plants until a judge intervened. HALF TRUE: Perry’s 2010 claim that Texas on his watch cut ozone, nitrogen oxide emissions. TRUE: Perry’s 2010 claim that Texas had installed more wind power than any other state. See Perry's full Truth-O-Meter record here. See Rick Perry’s full Truth-O-Meter record here.